Follow the rules | What Car? So if congestion is so infuriating and costly, its nonsensical that people still contribute by failing to follow the rules. It can be a sign of a lazy or inexperienced driver, or perhaps someone who is nervous about motorway driving, says chief inspector King. 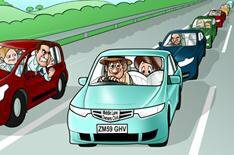 Many drivers have had no practical motorway instruction because its illegal for learners to go onto the motorway. However, the Driving Standards Agency (DSA) encourages learners to get experience on other high-speed roads such as dual carriageways, while questions in the theory test relate to the Highway Code, which covers the rules of motorway driving and says drivers should keep to the left, unless overtaking. On the surface, that appears to be a contradiction, but in reality its simply a practical problem. John Atkin of the DSA says: In many parts of Britain getting access to a motorway, if it was part of every driving test, could involve a pretty long journey parts of Cornwall, for example, are 90 miles from the nearest motorway. Although qualified drivers can pay for extra motorway lessons, too often its completely forgotten in the excitement of having passed the test. The Pass Plus course covers motorway driving, but according to the DSA only around one in eight people take part, despite the cheaper insurance premiums on offer. drivers, and wed like to see regular re-testing every five to 10 years for all drivers, which would dramatically raise the driving standards on all roads, including motorways.